If you’ve got combination skin you’ll know exactly how irritating it if some areas of your skin are oily, whereas the rest of your face is dry and flaky. Around sixty per cent of women have this problem, but few know how to deal with it. How do I Adapt My Skincare Regime Accordingly? A lot of women with combination skin make the mistake of treating their skin as one skin type, but it is actually two different skin types, so you’ll need a dual approach to taking care of your skin. You can use products that are specifically designed for oily skin on the t-zone area, but don’t use them on the rest of your face as they will leave your skin looking sore and irritated. Alternatively, you can use balancing products that are designed for normal skin. What’s the Best Way to Cleanse Combination Skin? Cleaning your face twice a day with a mild cleanser is an easier way to tackle the problem. This will remove excess oil without drying out your skin. It’s tempting to want to wash your face more than twice a day to get rid of the oil that builds up during the day, but this will irritate your skin and can make your skin produce even more oil to compensate. Use toner to mop up any remaining excess oil in the t-zone area, but you don’t need to use this on the drier areas. If you’re still bothered about shine in the t-zone area, use a blotting pad to mop up excess oils that build up throughout the day. Many women with combination skin shy away from using moisturiser because they’re worried that it will make their oily t-zone even worse. Even oily skin needs light moisturising to keep it staying supple, and the dry areas of your skin will definitely need welcome a moisture boost. Use a moisturise-rich lotion on the dry areas, but switch to an oil-free variety for the t-zone. Can I Balance My Skin? Look for products that contain alpha hydroxy acids (AHAs), retinols and vitamin A, as they will help to balance problem skin. AHAs will also get rid of the dead skin cells that can clog pores. However, both AHAs and retinols will make your skin more sensitive to sunlight, so you’ll need to apply employ adequate sun protection when you go outdoors to avoid burning. What Type of Make-up Should I Look For? 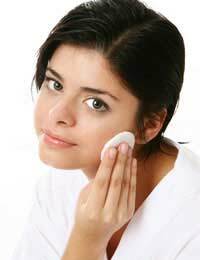 Make-up that absorbs excess oils is the best option. Matte foundation is a particularly good buy as it blots out shine, but you’ll probably find that you need to add some powder to your t-zone area later in the day to soak up excess oils. Oil-free make-up is the best alternative as it won’t add any extra oil to your skin. How Can I Deal with Blackheads? Exfoliating your t-zone area will help to loosen blackheads, and you can then get rid of them using nose strips that are specifically designed to unplug pores in your nose. They work by sticking to your nose and drawing out the blackheads when you peel off the strip. You can also use face masks to get rid of excess oil and draw out blackheads. These are best done two to three times a week so that your skin doesn’t get too irritated. It’s worth exfoliating the rest of your face once a week to get rid of dead skin cells, but anything more than that will probably be too searching. Dealing with combination skin means adopting a skincare regime that works for both the oily skin on the t-zone and the dry skin across the rest of your face. This is generally a case of keeping excess oils under control with twice daily cleansing and blotting, while caring for the dry areas with rich moisturiser. If your t-zone is particularly oily, you might want to use a cleanser for oily skin on it, but keep this away from the drier areas to avoid irritation. Once you understand the best ways to treat both skin types on your face, caring for combination skin is much simpler.